Cities are burdened with visions of future growth while grappling with inadequate infrastructure, climatic risk, local politics, and multiple layers of overlapping policy. How can they overcome the fragmentation of policy and practice to address the risks to urban water and rivers on which so many of them stand? This column draws on India’s experience to identify approaches that can be used to improve the complex processes of governance when it comes to these challenges. While there is little research as of yet that addresses the risks at the nexus of rivers and cities, there are growing opportunities to bridge this gap. The majority of the world’s future populations are likely to be living in cities in the Global South. These cities are laden with visions of future growth while grappling with their past of inadequate infrastructure, multiple layers of overlapping policy, and local politics. Many of such cities in India are also on rivers. 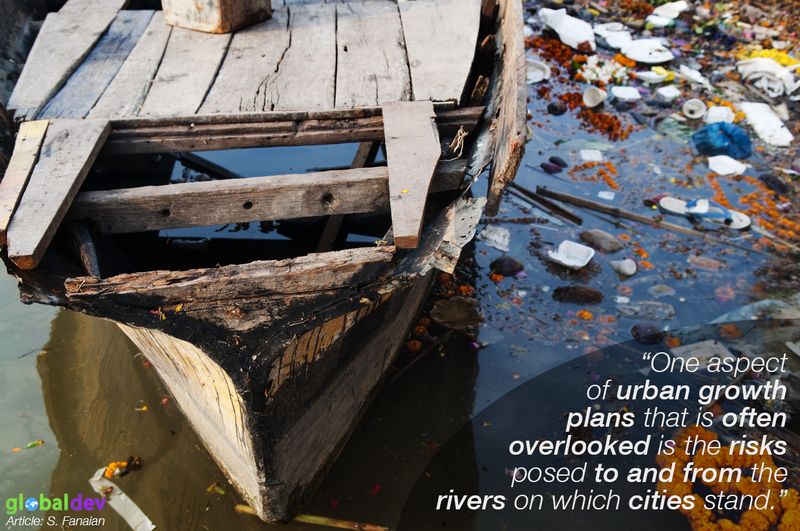 One aspect of urban growth plans that is often overlooked is the risks posed to and from the rivers on which they stand. These risks include urban floods, inadequate domestic water availability, and increasing river pollution due to sewage and waste release from cities. Delhi and the polluted Yamuna River, plus a constant search for new sources to supply Delhi’s drinking water. The 2015 Chennai floods, which were linked to high rainfall and backwash from the Cooum and Adyar rivers that run through the city. Mumbai’s continuing battle with urban floods, which is strongly linked to blocked river channels and development on the floodplains of the Mithi, Poisar, and Oshiwara rivers. The 2015 report by the Central Pollution Control Board of India noted that 37,000 million liters per day of untreated sewage water flows into rivers across the country. Coastal cities face similar risks. But while there is a growing body of research on risk management for coastal cities, little attention is being paid to the risks at the nexus of cities and rivers. While factors such as climate change and changing land-use patterns exacerbate these risks, a fragmented and reductionist approach to mitigating risks can cause more chaos. The reductionist view of water management is inherited from our past legacies and a Newtonian-oriented education that breaks down large problems into smaller parts in an attempt to solve them separately. This is seen in India with different departments specifically responsible for different functions. Urban water is managed through decentralized local governments (or boards depending on the city) separated between departments based on water supply, wastewater collection, and storm-water drainage. Floods are managed by state disaster management authorities, central ministries of water resources, and meteorological departments. Depending on their transboundary nature, rivers are managed by centralized state and national governments spread across different ministries of water, irrigation, agriculture, power, infrastructure, and the environment. Within such polycentric structures of governance, with multiple decision-making bodies, there is an immense challenge of co-ordination between the scales (local, state, and national) and departments for river and urban water governance. While every department might be aware of the possible solutions, its implementation would require an approach that connects departments (and other relevant organizations) and provides means for a systematic flow of information. Can we move beyond chaos? Indian governments don’t function in an objective vacuum of rules and policies: they include multiple social, political, and informal interactions that propel or limit outcomes. An understanding that integrates the layers of physical and social interactions involved in governing risk at the nexus of rivers and cities can provide insights into the complexities, and identify patterns within what is otherwise considered the chaos of governance. Most frameworks that address water management are derived from the Global North, and they fail to capture the internal dynamics through which water management occurs in India. One approach to mapping the dynamics through which water management occurs is via complexity theory. Complexity theory emerged as a study of complex systems with wide applications within organizational studies. Complexity theory explores systems in which a small change in one part can entirely change the system as whole, since every part is integrally interconnected with another. Here, as one problem is solved, new ones are created, leading to what are known as ‘wicked’ unsolvable problems. Cities and rivers are complex systems with wicked problems. Understanding the past events and political processes that shaped the current management systems, and knowing the physical and social nuances that can help to prepare for future uncertainties. Mapping the formal and informal networks through which the governance of risks occurs can help to understand the bottlenecks and missed opportunities. Bridging these information gaps can allow collective understanding of local capacities and the natural system to adapt to uncertainty and create resilient management systems. The rise of SMART cities and river rejuvenation plans in India offer opportunities to include smart management of water-related risks for the country’s cities and rivers. Safa Fanaian is a second-year doctoral candidate at the School of Geography and the Environment, University of Oxford and an Oxford-Indira Gandhi Scholar at the Oxford-India Centre for Sustainable Development.